It’s been a while since I touched base with the world through this blog. 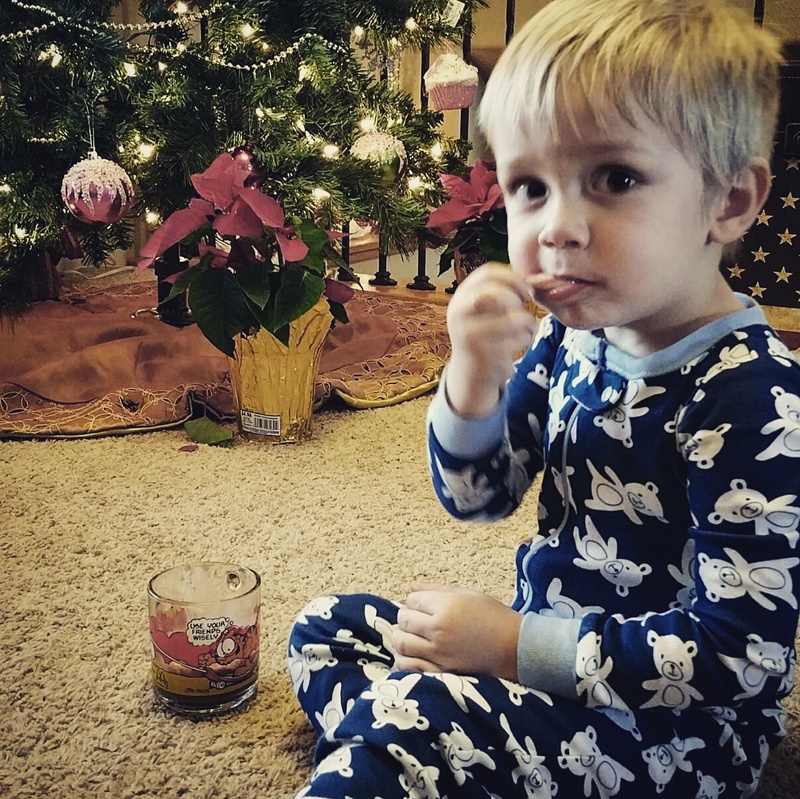 I don’t know for sure what happened, except that I got knocked up and then I got nauseous, and then I had no energy to cook, or run after my four-year-old, much less to write about any of it. But thank God, that’s mostly over. I am mostly back. And thanks to a recent, much-needed vacation to Hawaii, I’ve found new inspiration to pick up a pen and write. Now I practically can’t stop. Words are coming out of nowhere. Lyrics on napkins, messages on grocery store receipts, musings on the back of my hand, goals on my thighs…kidding! I meant, my funeral song list. (Which happens to be the same as my wedding song list, by the way!) No, I think it was actually on my daily schedule. The one that I can’t find. Come to think of it, I don’t even know if I have one! See how much fun we can have with words?! Ok, maybe that has more to do with the random thoughts in my brain. But hey, it is WORDS that give me a vehicle to express those random thoughts. I’ve been reading alot, too. Mostly on other blogs and on Pinterest (does that count? 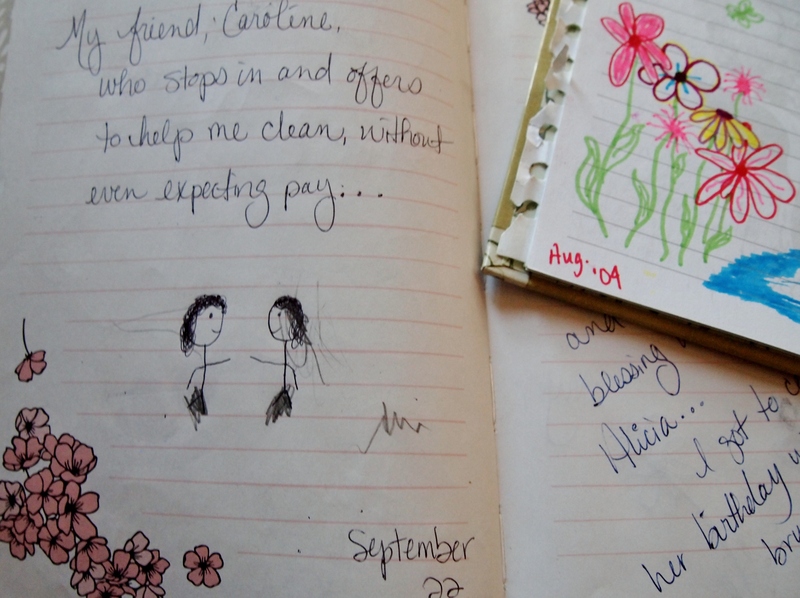 ), but then the other day, I pulled out some old journals and began reading them. By the way, if you are needing a reality check, or a good laugh, or a reason to be thankful, or maybe even a reason to cry, read your old journals. 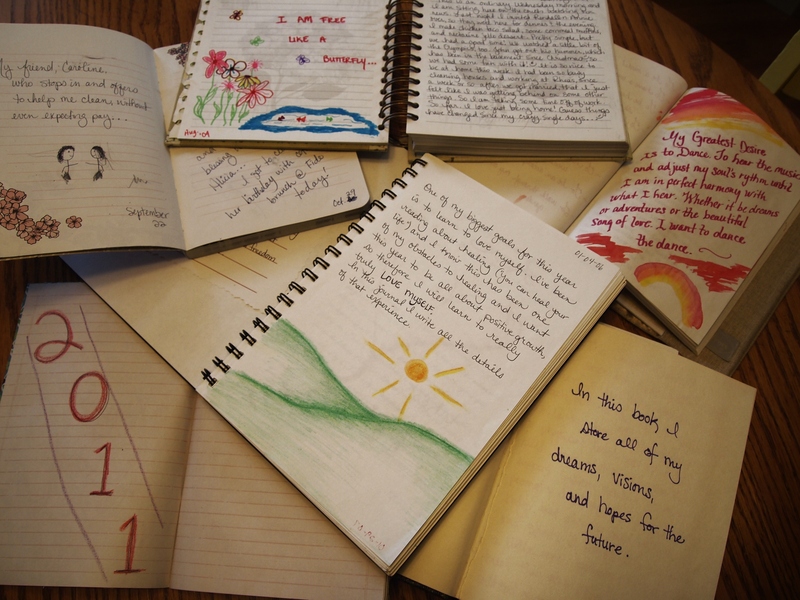 Assuming that you have written in journals, at some point in your life! Otherwise don’t bother. Just read someone else’s! (Ok…so maybe not your teenage daughter’s). Really, though. It is qute enlightening. I am wondering why I haven’t dug them out sooner! Oh, to live as uninhibited as I did, in 2003! 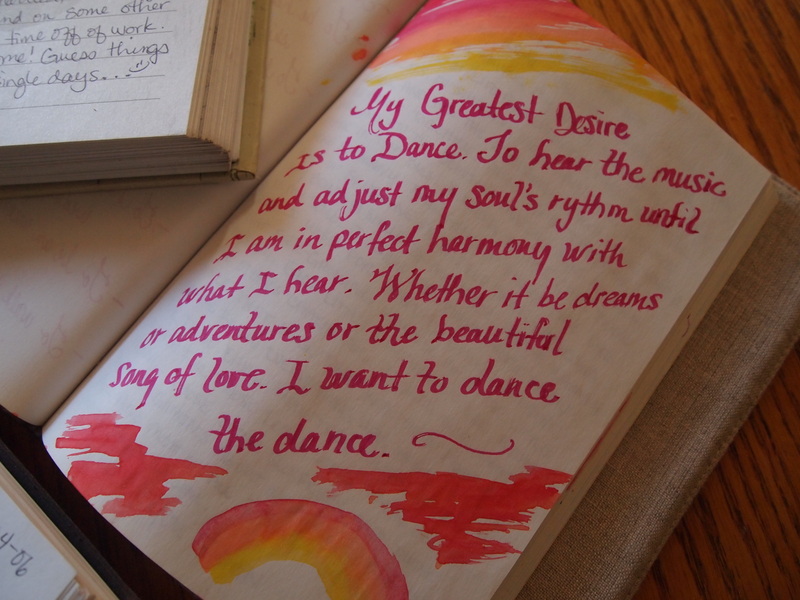 My greatest desire is to dance. That was 2006. I think I may have learned to do this at least a little that year. At least, I had plenty of tests-I mean opportunities to do so. …to love unconditionally without any fear, and in that love, promote healing and freedom to all that I meet. It was only a few months later, that my dad died of cancer, and my belief in God’s love and goodness, was severely tested. How could I ever forget that moment when I met my daughter for the first time? …soft little hands grasping mine. I’ve never felt more alive, than I did in those early days of her life. This one cracks me up. I had started a list of my “favorite people” and why I’m thankful for them. This page was about my friend, Caroline. I drew this silly stick figure drawing of the two of us. Then Ari, my little toddler, came along and added her own decor to the page. So much has changed since then, and that wasn’t even two years ago. I do think it’s good for us to visit our past from time to time. So long as we can remain thankful for the present. Sometimes, when I remember where I’ve been, it helps me remember who I am. So thank you, my dear readers, for coming along on this journey into my past life and writings. I hope it inspires you to write your own words, your own story. And perhaps start creating your own pile of “old” journals.